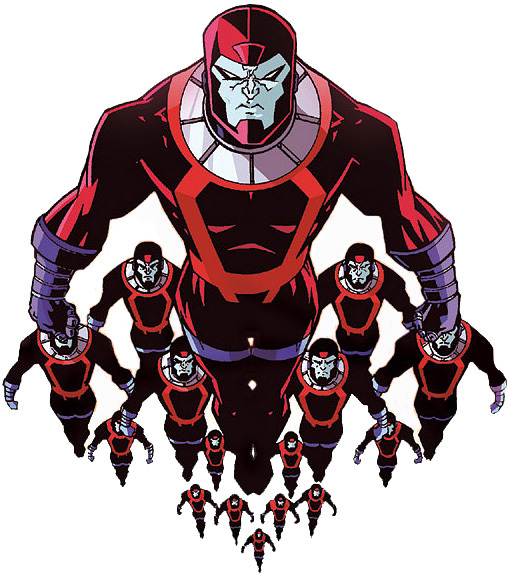 During the Cyborg Superman’s tenure as Grandmaster, he managed to develop large versions of regular Manhunters that were powered by Green Lantern energy with the capacity to destroy worlds. In addition, he created nanite scale Willhunters that were able to destroy a persons mind and convert them into a Manhunter. Enhanced Abilities: Manhunters posses superhuman strength, durability and endurance. Body Armour: Manhunters are made from an alien metal that provides a high degree of protection from energy and physical attacks. Energy Blasts: Manhunters can project energy blasts from there hands. Self Destruct: Individual Manhunter androids possess a self destruct system which is extremely powerful in not only destroying the unit in question but anything surrounding it. Camouflage: Manhunters have been capable of adopting a terrestrial camouflage allowing them to disguise themselves as members of other races and thus hide their identity. Energy Absorption: Manhunters possess Power Batteries located beneath the faceplate and located in their heads allowing them to forcibly steal any form of Emotional Spectrum energy or use it to energize a Power Ring. Flight: Manhunters are able to fly. Following that time, the Manhunters continued their service though it was believed that in time they became more obsessed with "hunting" criminals rather than bringing justice. Eventually, their code of No Man Escapes The Manhunters became more important to them than achieving their programmed goal of enforcing justice. Two events ultimately altered the Manhunters original purpose. The first, was a glitch in there programming created by Krona, which resulted in the Massacre of Space Sector 666. The second, a loss of contact with the Guardians, resulted in the Manhunters conspiring to claim the Guardian’s Central Power Battery, ultimately the Guardians overcame their android servants, stripping them of their power and banishing them across the universe. The Manhunters bided their time, waiting for the time to strike back against their former masters.